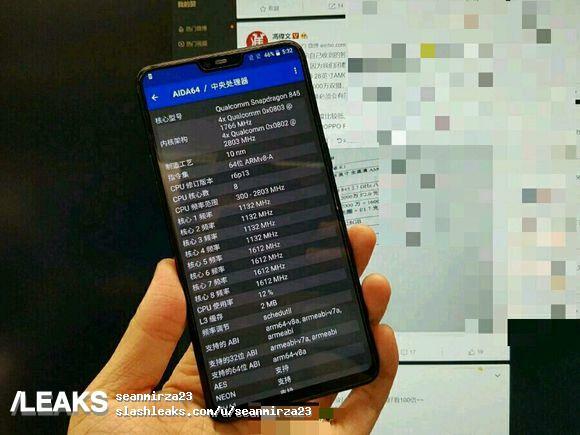 OnePlus 6 Hands on image leaked showing running Snapdragon 845. HomeNewsLeaksOnePlus 6 Hands on image leaked showing running Snapdragon 845. We already have seen the official teaser of the OnePlus 6 with the iPhone X like notch on the middle top of the screen. Now we are seeing the first ever OnePlus 6 Hands on image. In which the user is showing the specs sheet of the device. As rumored earlier that the upcoming OnePlus flagship device will have the latest Snapdragon 845 chipset. Now with this leaked image. It seems to be no more of a rumor. This new OnePlus 6 device along with this powerful Snapdragon 845, will also have the 8 GB of RAM and a gigantic 256 GB of internal memory. There are no news about the Battery and camera on the device. But seeing the OnePlus rituals we can assume that the device will pack a higher mAh battery and a better dual camera. Some rumors suggests that there could be a 3-camera setup on the back. Just like we saw on the Huawei P20 Pro. But there are no such leaks as of now. One more confirmed reports suggests that the OnePlus 6 will enable users to hide the notch if they don’t like it. It will be easily switched on or Off using the notch settings in the menu. We saw same setting in the latest Android P. Which made an option for future Android devices with notch, to hide it, to increase or decrease their size. We will be looking forward for more news regarding this smartphone. You can follow us on social media or bookmark our site to keep updated.